Surrey is working to evolve the existing X-band APM into a Ka-band APM which will support a data throughput up to 1 Gbps. 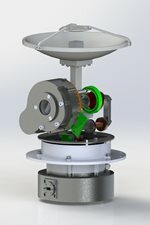 Ka-band APM product development will consider both coaxial and waveguide feeds. Rotary joint design and arrangement is currently being reviewed. It is likely that an in-house Cassegrain reflector will be designed to achieve the required gain. The larger antenna and RF feed can be easily incorporated into the existing mechanism with minor modifications. The proven fundamental mechanism components remain identical to the first-generation X-band APM, made possible through the design’s modular layout and generous design-margins.